Goodreads Description: The screams of a child trapped in a blazing fire, echo in the depths of a deserted stone hallway, leaving Bodhi terrified and shaken to his core. Has the dark stormy night conjured a nightmare for him or is this a premonition of something terrible coming his way? Max Devon lives a happy peaceful life with his wife and daughter. When his past comes knocking on his door, his whole world is threatened by this harbinger of death. Will he be able to protect his family in time? Will he be able to escape his cursed past? An ancient evil is rising, thirsty for power and control. Forgotten friendships would have to be revived, new alliances formed before everything is lost. Beware the family ties. There’s something sinister lurking there. 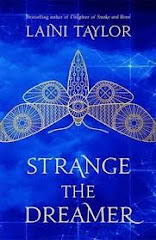 My Review: I was given a review copy by the author, Shirley Simon, in exchange for an honest review. Max, his wife, Claire, and their daughter, Noreen, live a peaceful life in their small town, until Max's Aunt Ida returns after many years, trailing trouble right behind her. She's the last person Max wants to see, as she drags up a dark family past he thought he'd put to rest. But Ida isn't interested in letting him forget, and the demons she intends to raise may be more real than anyone imagined. 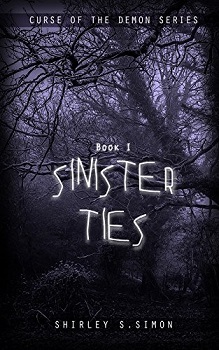 Sinister Ties is a simple horror tale of family bonds and dark magic. The writing is solid and steady, with a lyrical flow to it that makes this a pleasant read. The plot hits from the first chapter and keeps flowing at a steady rate. Tension mounts, though the author often withholds information from the reader for too long at times, which is more frustrating than tense. Still, once all the cards are on the table the story hits hard with pulse pounding action and an excellent pacing that carries through to the end. The characters were okay, but I feel like more could have been done with them. I didn't really connect with anyone. In fact, I was probably most drawn to Ida, as she seemed to be the most animated and proactive. She drove much of the plot, being the villain, which made it hard not to be drawn to her. The other characters all reacted to her and seemed to go with the flow more than tread their own path. As well, the author tends to head-hop. Though the writing wasn't super confusing, the head hopping takes us out of the story and disorients the reader, as we have no idea whose thoughts we'll be privy to next, while meanwhile missing out on others. As this was Max's story and he was framed as our hero, I'd wished we'd stayed in his point of view more. Despite that, the plot evolved nicely and I liked the backstory and build up as to how the demon came to be locked away. The climax was a satisfying crescendo and wrapped things up nicely while still leaving room for a sequel. I will say there are some strong Christian overtones in the book, most of which didn't affect the story until the end. One of the characters prays to God during the climax and then is relieved God "heard her prayers," which added some heavy religious overtones to the story. All in all, this was a lovely scary story with a final chapter that hit all the right notes. It's short and to the point with flavorful writing. It will be interesting to see where the author goes from here. TL;DR: 3/5 stars. A pleasantly chilling horror tale to keep you up at night.